That's what they tell me. But I am more than a name. More than they tell me. More than the fact and statistics they fill me with. More than the video clips they make me watch. More. But I'm not sure what. 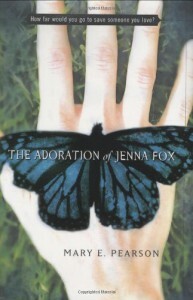 I won The Adoration of Jenna Fox by Mary E. Pearson from Dewey, and I'm very glad I did. Thank you, Dewey, for sending this book to me! In fact, I had been coveting this book for some time. The first thing I noticed was the beautiful book cover. 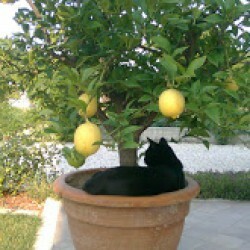 What about the butterfly, I wondered, in abook that deals with a girl awakening froma coma? Of course, the butterfly has a meaning, but I'm not going to tell you what it is... too spoilery. After a terrible car accident, Jenna Fox, a seventeen-year-old girl, awakens from a year-long coma to find out that she doesn't remeber anything of heself or her accident. Jenna doesn't recognize the world she lives in: a new house in a new state, with parents who seem to adore her but control her every movement. Slowly, Jenna starts to leanr things again, and discovers truths her parents want to keep hidden from her--truths that involve her own identity. The accident was over a year ago. I've been awake for two weeks. Over a year has vanished. I've gone from sixteen to seventeen. A second woman has been elected president. A twelfth planet has been named in the solar system. The last wild polar bear has died, Headline news that could not stir me. I slept through it all. Besides Jenna's search for identity, the main theme is science and the bioethical oimplications of human manipulation of DNA. How far will you go to save someone you love? How far is it ethically acceptable to go, to save a human life? This book, most of all, raises a lot of questions. Moreover, it is a beautifully written book, almost poetic in its word choice. As Jenna looks up new words in the dictionary to register their meaning, the reader is also drawn to analyze words more closely and to discover new meanings of these words. Through Jenna's eyes, we learn of a different world, one that could reasonably exist in a not-so-distant future, if scientifical developments go on at today's pace.